We have now heard from our interfaith Lenten Series preachers, Imam Ammar Amonette and Rabbi Michael Knopf. If you missed hearing them in person you can listen to their sermons here. I hope you will recognize just how similar their messages have been to what we have heard from The Rev. Jean Pupke, from The Rev. John Kinney, and from what you hear regularly on Sundays at St. Paul’s. 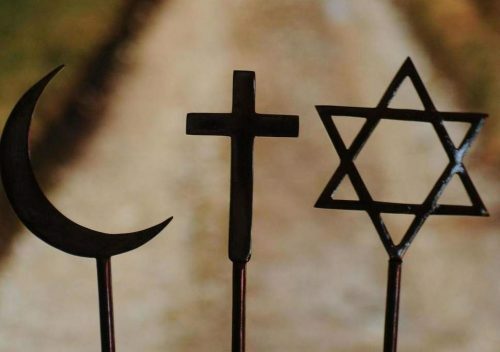 So many of our Christian values overlap with the values of Islam and of Judaism. It is important to consider just how much of our perceived religious differences may be largely differences of distance, of geography, of history, or of ethnic and cultural differences. Looking beyond the externals allows us to recognize how much we share with peoples of other faiths on the inside. Consider also that the largest factor in determining one’s religious affiliation is the religious affiliation of the family into which one is born. Most people are born into their faith, rather than having chosen it. At some point one must choose to accept, or reject, that inherited family religion, but few people actually change their faith of birth. As a spiritual exercise, try to imagine how your life might be different, right now, had you been born Muslim or Jewish. Try to imagine how you might view Christianity from either of those other perspectives. Here is the Interfaith Prayer we have been using each week of our Lenten Series. I invite you to pray it now, and reflect upon how God may be inviting you to view our faith, other faiths, and faith itself from a new perspective. Learning from other faiths does not subtract anything from our own faith. Learning from other faiths adds perspective to our own faith. Holy One, creator of all worlds and of all peoples: we thank you for the wonderful diversity of races and cultures throughout the world. Having spoken to people of faith in every time and place, you are the Eternal One worthy to be worshiped by all. Called LORD by your Jewish children; Father, Son, and Holy Spirit by your Christian children; Allah by your Muslim children; and by many other names, or by no name at all, by your other children; your full majesty and mystery are beyond human knowing. Give us grace to hear your truth in the teachings of Moses, of Jesus, of Muhammad, and of others. We rejoice that you have invited all of us into a beloved community with you, in this city by a river. May we live here as sisters and brothers in faith, and we pray that peoples of all faiths may together serve you in love. May we become a city of God. Amen.